Horiuchi, Yu Wettersten, Nicholas Vasudevan, Rajiv S. Barnett, Olga and Maisel, Alan S. 2018. Stethoscope as a Vector for Infectious Disease. Current Emergency and Hospital Medicine Reports, Vol. 6, Issue. 3, p. 120. Breen, Anne E. and Hessels, Amanda J. 2017. Stethoscopes. Nursing Management (Springhouse), Vol. 48, Issue. 12, p. 9. 2016. Infektionsprävention im Rahmen der Pflege und Behandlung von Patienten mit übertragbaren Krankheiten. Krankenhaus-Hygiene + Infektionsverhütung, Vol. 38, Issue. 1, p. 4. O'Flaherty, N. and Fenelon, L. 2016. Alternative stethoscope decontamination methods: old practices die hard. Journal of Hospital Infection, Vol. 92, Issue. 4, p. 411. O'Flaherty, N. and Fenelon, L. 2015. The stethoscope and healthcare-associated infection: a snake in the grass or innocent bystander?. Journal of Hospital Infection, Vol. 91, Issue. 1, p. 1. Grandiere-Perez, L. Bovet, J. Beaudron, A. Saulnier, P. Blanchi, S. Delemotte, M. and Ramanantsoa, C. 2015. 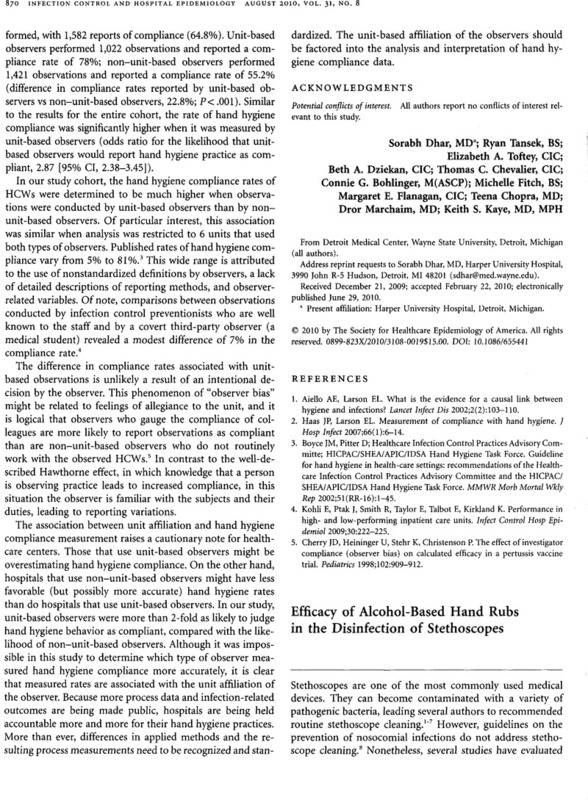 Efficacy of an ethanol-based hand sanitizer for disinfection of stethoscopes. Journal of Hospital Infection, Vol. 91, Issue. 2, p. 183. 2015. Infektionsprävention im Rahmen der Pflege und Behandlung von Patienten mit übertragbaren Krankheiten. Bundesgesundheitsblatt - Gesundheitsforschung - Gesundheitsschutz, Vol. 58, Issue. 10, p. 1151. Muniz, Jeanette Sethi, Rosh K.V. Zaghi, Justin Ziniel, Sonja I. and Sandora, Thomas J. 2012. Predictors of stethoscope disinfection among pediatric health care providers. American Journal of Infection Control, Vol. 40, Issue. 10, p. 922. Badrikian, L. Souweine, B. and Traoré, O. 2011. Les étudiants en médecine désinfectent-ils leur stéthoscope et l’électrocardiographe après utilisation ?. Médecine et Maladies Infectieuses, Vol. 41, Issue. 7, p. 402. 1.Gerken, A, Cavanagh, S, Winner, HI. Infection hazard from stethoscopes in hospital. Lancet 1972;1(7762):1214–1215. 2.Garner, TK, Rimland, D. Stethoscopes and infections. JAMA 1982;248(3): 310. 3.Smith, MA, Mathewson, JJ, Ulert, IA, Scerpella, EG, Ericsson, CD. Contaminated stethoscopes revisited. Arch Intern Med 1996;156(1):82–84. 4.Brook, I. The stethoscope as a potential source of transmission of infection. Infect Control Hosp Epidemiol 1997;18(9):608. 5.Wurtz, R, Weinstein, R. Microbiologic contamination and cleaning personal medical equipment. JAMA 1998;280(6):519–520. 6.Bernard, L, Kereveur, A, Durand, D, et al.Bacterial contamination of hospital physicians' stethoscopes. Infect Control Hosp Epidemiol 1999;20(9):626–628. 7.Thofern, UAR. Bacterial contamination of hospital physicians' stethoscopes. Infect Control Hosp Epidemiol 2000;21(9):558–559. 8.Boyce, JM, Pettet, D; Centers for Disease Control and Prevention. Guideline for hand hygiene in health-care settings: recommendations of the healthcare infection control practices advisory committee and the HIC-PAC/SHEA/IDSA Hand Hygiene Task Force. MMWR Morb Mortal Wkly Rep 2002;51(RR-16):1–45. 9.Cohen, SR, McCormack, DJ, Youkhana, A, Wall, R. Bacterial colonization of stethoscopes and the effect of cleaning. J Hosp Infect 2003;55(3):236–237. 10.Hill, C, King, T, Day, R. A strategy to reduce MRSA colonization of stethoscopes. J Hosp Infect 2006;62(1):122–123.